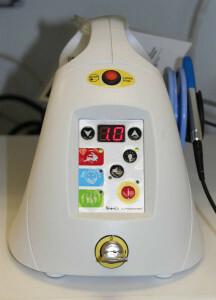 Laser for use in our modern dental practice. Gentle re-shaping of gum tissue when making a crown for a patient. Some frenectomy and biopsy procedures. Control of bleeding such that sutures (commonly referred to as “stitches”) are not necessary. Due to the gentle and precise nature of this tool, less local anesthesia (a.k.a. novocaine) is necessary. And in addition, healing is quicker and there is much less post-operative discomfort. All of this results in a better experience for patients in our office in Orange, CT. The laser allowed us to perform a frenectomy with no bleeding, no stitches, and virtually no post-op pain! Many patients come to us solely for us to use our laser to perform frenectomies. The majority of these patients are pre-teens and teenagers but we occasionally see adults for these purposes as well. Contact us for more information.